Fox Plumbing & Heating was called to a neighbor’s home on Capital Hill to help them with the installation of a gas line for their fire pit. Our Neighborhood Plumbing Professional, JP, thought this was an interesting service. Our Plumbing Professional wanted to provide some tips to be aware of if you’re considering installing a gas fire pit at your home. Fox Plumbing & Heating was called because a customer had just remodeled and landscaped their yard, and they installed a new porch and wanted to add a gas fire pit. They decided to call a plumbing professional because licensed plumbers are qualified to work with, and install, gas lines. This is because professional plumbers work with gas on traditional tank and tankless water heaters. Gas can be very volatile to work with and dangerous if not handled properly. The customer wanted to have the gas run from the meter, directly to the fire pit in the backyard. Fox Plumbing & Heating first secured the permits from the city of Seattle. JP then open trenched the entire distance from the gas meter to the porch. 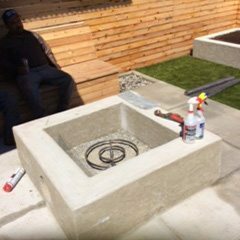 If you’re considering adding a gas fire pit, Fox Plumbing & Heating strongly suggests that you contact a gas specialist. Once installed, JP had to ensure that the British Thermal Unit (BTU) ratings were correct and safe. Then you’ll need to have the process reviewed by a city representative to ensure that the new gas line is up to code and safe. This installation only took him a few hours to install, but doesn’t include having it tested and signed off by the inspector. Installing an outdoor gas line should take little time for a licensed professional to complete. A gas permit is necessary to work and add gas lines for a home, office or other location. 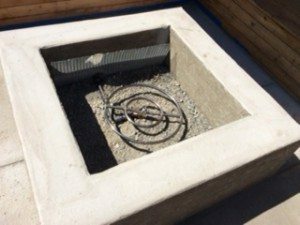 Accessibility is important when installing a gas fire pit because annual maintenance is required. Be sure that you are able to access the necessary points for maintenance. Handymen and electricians are not usually licensed to install or change gas lines. Licensed and bonded plumbing companies have specially trained people who are able to work with gas lines.